In the last blog post, I introduced the notion of four leadership Intelligences – Awareness, Trust/Integrity, Authenticity, and Commitment – that support the development of the being of being a leader. I explored Awareness in that blog. In this post, I will examine leadership intelligence #2, Trust/Integrity. Typically, trust is misunderstood and can be the source of much confusion in organizational life. I will focus on the complexity of Trust as applied to leadership development. In the next post, the third in this four-part series, I will examine Leader Intelligence #3, Authenticity. Trust based on integrity develops our word and offers reliability. Consider that trust is the foundation of human development. How we generate trust determines how we relate, live, and coordinate action with others. Without trust, inaction prevails, relationships falter, and we become a victim of circumstances. Most of our work to understand trust is confusing and causes a great deal of suffering. Partly, we are unsure what to observe or how to measure trust, as detail in this video: What we don’t understand about trust. Often, we measure trust by how we feel, not what we see. Shifting our relationships to trust will transform every facet of our lives, a worthy project, given how fundamental trust is to our very existence. a style: how we experience or assess niceness, politeness, or courteousness. a belief: how we assess devotion for/faith in/loyalty to a concept or process. a safe space: how we experience an open environment or consensus to take risks. We also hold misperceptions about trust, such as those noted by author and philosopher, Fernando Flores, in his book Building Trust. First, we explore our view of trust. Static: Either trust exists, or it doesn’t exist. From this view, trust occurs as a belief, or “safe space,” which is either present or not. When trust is broken, we deem violators unworthy of trust. We can no longer trust in the same way. Dynamic: Trust is fluid, occurring between full self-expression and breaches. From this view, we expect breaches to occur. Addressing breaches reveals what’s missing in order to strengthen trust. Through continual practice, we see the dynamic of trust includes breaches and betrayals. Once we accept a dynamic view, we can examine our approach to trust among Simple Trust, akin to an infant’s trust or magical thinking; Blind Trust, holding beliefs in the face of contrary evidence or denial of evidence; and Authentic Trust, which Flores details. With authentic trust, we engage and address breaches, as the very access to building trust. We cultivate the deep connections necessary to generate workability and coordinate action. Being trustworthy empowers our whole self and fosters mutual interdependence. 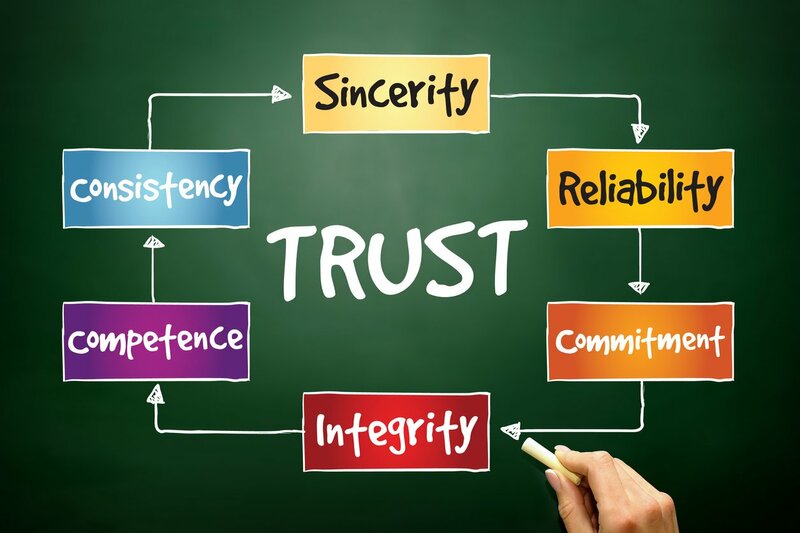 To be effective, build relationships, and lead change in uncertain times, leaders require trust: to become trustworthy and to cultivate authentic trust in others. 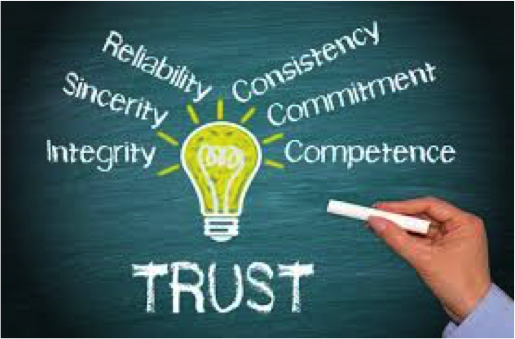 Cultivating trust is foundational to generating agreements and commitments. With enhanced commitments, we generate more intentional action, develop motivated and inspired colleagues, and create greater levels of trust to act, even in the face of uncertainty. Many change management programs neglect this simple fact: Organizational change is about human interaction. Individuals only venture into the unknown when they feel conﬁdent. Often conﬁdence is the result of trusting one’s capacity to act on promises. Without this “conﬁdence to act,” people wait for hard evidence, for others to act, and for people to prove their integrity. Waiting becomes a self-fulﬁlling prophecy, giving permission for others to wait. Inaction takes a heavy toll on organizations: missed opportunities squander time and ﬁnancial resources; expectation of inaction lowers morale, discouraging initiative; and the consequence of inaction fosters resignation, encouraging cynicism. Authentic trust is not a state we achieve; it results from conditions we assess in others and cultivate in ourselves. Trustworthy leaders hold themselves accountable by satisfying three conditions: 1) Integrity, 2) Competency, and 3) Reliability. Integrity: I am my word as whole and complete. I am who I say I am. My private conversations match my public conversations. I am held to account for my word as whole and complete and hold others accountable to their word, engendering mutual respect. Competency: I can do what I say I can do. I am knowledgeable in the areas that I say I am. My perceptions about what I know and can do match what I express, enhancing my credibility. Reliability: I will do what I say I will do. I am consistent in the way I show up and in my ability to deliver on what I’ve said. When I cannot deliver, I am willing to communicate to all parties in a way that mitigates any impact. Becoming trustworthy begins with myself and then properly assessing and honoring these conditions in others to generate trust as a social practice.